A few months ago I took a good look at the type of riding I was doing, and compared it to the type of bike I was riding. There was a mismatch, and this is the story of how I made it better. With four riders at my house, I've got room (physically, and financially) for exactly one bike of my own, so it's got to do everything I need. I was riding a very nice Surly Karate Monkey, outfitted for (mostly) city riding, but with a full range of mountain bike gearing. I justified it by telling myself that I could always take it to the mountains, or do a cyclocross race or two. Truth is, I used exactly 3 gears 99% of the time. When I've got spare time, I don't go mountain biking any more, I go surfing. And for me, cyclocross races are only fun to watch. So I sold the Surly, bought a nice new wetsuit, and invested in a 1970-something Raleigh Sprite, with 8 gears. I put a little more into new tires, brake pads, and a saddle, and then started looking for a good system for hauling stuff around. I don't have much of a commute, but I do need to roll by the store now and then, or haul stuff to the UPS store. 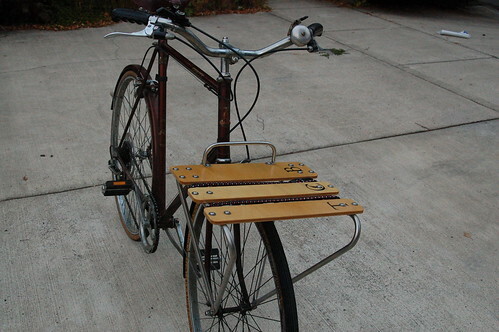 I considered all the standard stuff like rear racks, those foldable wire grocery haulers, trailers, and Xtracycle setups. 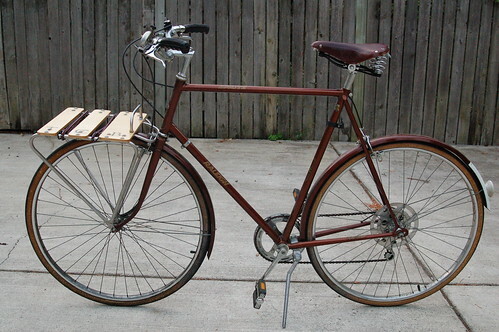 I finally decided that a front rack, known as a porteur rack, was going to meet my needs the best, and then it was just a matter of narrowing down the options. I was most interested in finding something locally made. Living in Oregon made that a very real possibility. I was starting to focus in on the CETMA racks down in Eugene, particularly the 5-rail, which looked about perfect for my needs. I also eyeballed the Ahearne racks, which are very sweet, and can be nicely customized (also see their flask holder). I checked out some DIY porteur racks, too, but didn't figure I had either the chops or the gear to make that come together. Here's the bike, naked with the rack. Looks like a great rack, but I really don't think it's wise to carry your child on the front of your bike without any sort of constraint -- I mean, really, what keeps the kid from falling off if you hit a curb or lean too far into a turn? That last photograph gives me chills. @JW, sorry about the chills. You're right, nothing keeps the kid from falling off if we hit a curb. Or me for that matter. So I don't hit curbs. Same deal with acrobatics in turns...I don't approve. 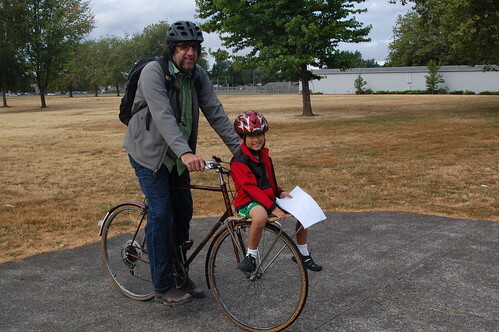 Not mentioned in the post is the fact that when I've got a kid on the front, we stay in first gear, the kid wears a helmet, and we never go very far (we live a couple of blocks from school). The point was more about carrying capacity. I'm actually more concerned about him putting a foot into the moving spokes. Which has actually happened. It only took one time, and now he keeps his feet clear! BTW, this kid has had his share of scrapes. One time he was on the back of a bike, strapped to a kid carrier, and wearing a helmet. A backpack strap in a front basket got tangled in the front wheel and the bike turned into a ferris wheel. The kid landed with the bike on top of him because he was strapped in. Hi Bren, First off that is a jolly nice looking rack. It is great to see fine craftsmanship. Secondly I totaly agree with your comments on carrying your child. I recently witnessed a cycle end over as you described. The little lad 'safely' strapped in the high back, approved seat on the back suffered horible lacerations to his face, despite wearing a helmet. His poor mother was distraught. When I was 5 or 6 (hey! it was a long time ago!) I was being taken to school by my big brother on a similar front rack to yours. Halfway there I was ejected from the rack when my brother decided to jump a grass bank (berm ?US?). The only injuries I experienced were from being run over by said brother on said bicycle. This was before helmets. I had shorts and a jumper. That is a good looking rack. It would seem to me that the quality and value here is better than the CETMA offerings. Those handlebar mounts and lack of fork crown mounting just don't seem right to me. I guess if your not spending more than 20 or 30 bucks for your handlebars thats ok. TCB is also offering customization for just a little more, it's looking like a better choice than the VO porteur rack. 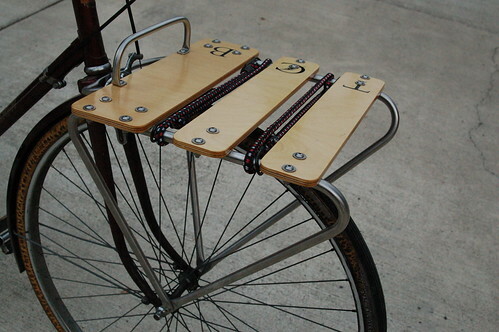 I'm about to start buliding a VO polyvalent, and this is the rack that just made the top of my list, Thanks for TCB link.